We’re starting to see some of the face materials being attached to the Canopy Hilton’s exterior.The brick veneer is Bowerston Shale Company Red Smooth blend. The bumpout with the industrial-style bay windows will use a darker and browner blend called “Pioneer Smooth”. Some of the “Sauteed Mushroom” fiber cement panels are also visible underneath the scaffolding. “Rockport Grey” and “Dark Ash” (light grey and dark grey) fiber cement panels will be used on the upper levels and to provide visual interest being the bricked spaces. Most of the sheathing is in place, as are most of the windows.The bridge blue bands around some of the windows is probably sealant/waterproofing material. An interesting little detail here – during the excavation, some remnant fragments were found from the former Stand Theater, which occupied the site from 1917 until its demolition in 1993. It was a grand building in its time, designed in an Egyptian Revival theme (which the Carey Building emulated when it was built a few years later) and capable of sitting 1,650 in golden age splendor. But the theater was never well designed for the transition from stage to screen, and after decades of decay, it closed first in 1976, and then reopened for a few years at the end of the 1970s into the 1980s for live shows, but the expense of maintenance proved a burden on shoestring budgets. Although on the tail end of urban renewal, the car was still king in the early 1990s, and a parking lot was deemed a better alternative to a decaying theater whose revitalization attempts had failed. A few of the more decorative pieces that were found will be put on display in an exhibit inside the hotel lobby. The 131-room hotel, on the east end of Downtown on the 300 Block of East State Street, is expected to open in 2019. Baywood Hotels, the developer, has been quite busy lately, purchasing the five year-old Fairfield Inn at 359 Elmira Road a few weeks ago. Rather curiously, the $5.9 million purchase of the 106-room hotel was $1.1 million below assessment. The sale used a “bargain and sale deed”, which one often sees with foreclosures. Bargain and sale deeds are riskier than standard deeds. It basically means that if the property has an issue or unpaid bill, you’re on the hook, not the seller. The curious details of that sale makes me think of a never-completed story the Voice was working on involving the Fairfield. Not long after the Voice launched, the then-owners reached out in an email, saying they had constructed and opened the Fairfield, and after being open almost two years, “we can attest that there is no need for hotel rooms since demand is on a downward slide and we are having trouble servicing our debt. 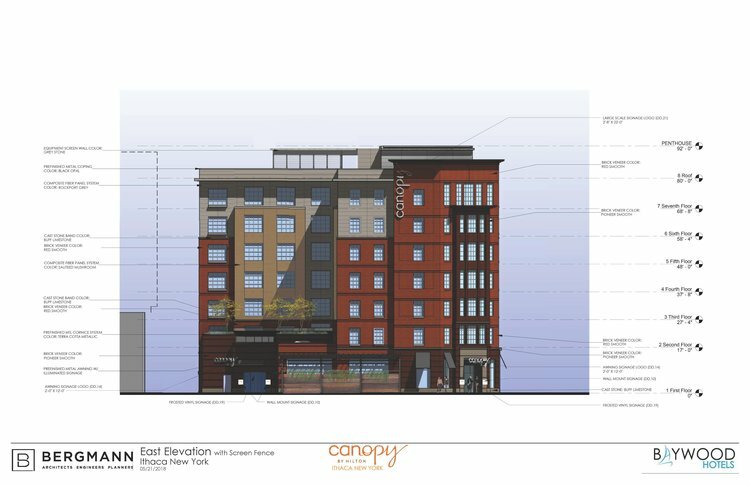 We also feel the Ithaca City officials are artificially generating demand hype to attract more hotel developers along with promises of tax abatement.” We had worked out this idea where their story would be part one, and getting the city and business officials to respond would be part two. I did an interview with the Fairfield owner and manager, but to prove their claim wasn’t just their hotel and that it was a citywide/regional problem, we needed hard data, proprietary information on occupancy rates and things like Revenue Per Available Room (RevPAR). The regional data of all hotels combined did not back up the claim, and with none of the Fairfield’s peer hotels were willing to take part or even support or refute the Fairfield owners’ claims, there was an inability to expand the story beyond the Fairfield’s anecdotal experience, and so it never moved beyond a first draft. It was the first in-depth story I had worked on that failed to pan out. In retrospect, I suspect the truth was somewhere in the middle. Given that one of the boutique hotels was cancelled, and how much time was needed for the new downtown hotels to obtain financing, there was clearly some concern from lenders about what the market could support. But because those new hotels are opening over a period of a few years, and local economic growth has continued, the worst fears of the hotel “boom” have been avoided. As previously mentioned on the Voice, the new 131-room Canopy by Hilton is one floor short of topping out. Interestingly, the ground level/lobby uses Georgia-Pacific DensGlass fiberglass mat sheathing, while the upper level use National Gypsum eXP boards. I’m not sure why the change – both are fire-rated, mold and water resistant. It probably doesn’t have to do with the exterior finishes (brick veneer is used at both ground level and on some of the wall projections above), but it’s possible it has to do with the construction material. The ground level is composed of poured concrete, while the upper floors are structural steel and accompanying steel stud walls. Regardless of the reason, both are being covered with the same water-resistive barrier. You can see the interior stud walls through the rough window openings, but interior work hasn’t progressed much farther than that on the more recently erected upper floors. The lower floors appear to be undergoing utility rough-ins. It still isn’t clear what the replacement panel color will be for the yellowish “Applesauce Cake” – not sure if Whitham Planning and the rest of the project team persuaded the city “Dark Ash” grey was okay, or if another color was chosen. If someone knows, feel free to chime in the comments.